Living in The Malvern Hills an outdoor sports watch has a lot of appeal and a watch with an altimeter makes some sense too.When the watch then has a black face and an orange strap, the deal is practically done. 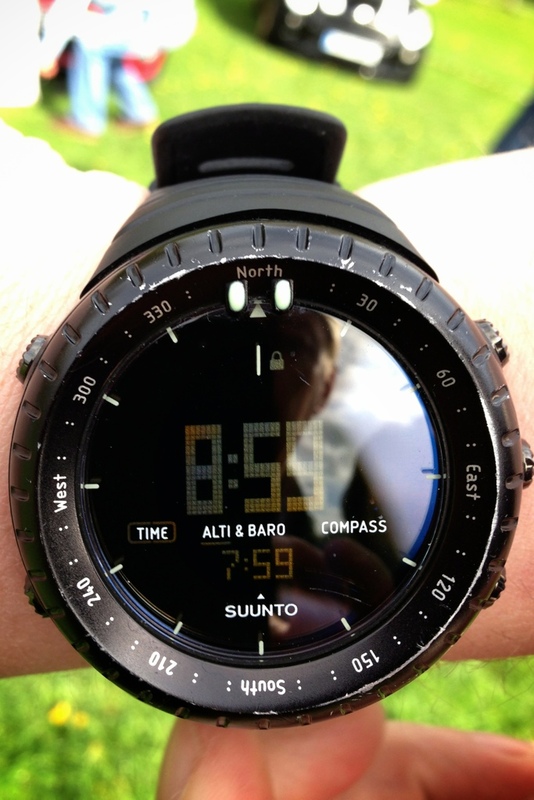 Suunto is probably best known for their dive computers, both wristop computers, and the kind that attach to a SCUBA diver’s regulator. However, they also make several lines of outdoor / mountain orientated wristop computers. Plus they have a long history of excellence in manufacturing compasses. Plus a whole host of other things such as difference measurements, logbooks, “start from zero,” depth measurements (for when you go under water), rotating bezel, button lock, etc. Frankly, what initially caught my eye was the look and style of this watch. Many would call it brash. I call it cool. Gibbs from NCIS wears an orange strap watch albeit an Omega, the colour is good enough for him and its good enough for me. Also to me the style of the face itself is superb and the strap is easy to change should you wish. There’s a high-quality double hinge on both the top and bottom bands, which is an incredibly strong mechanism, and a good sign of quality. 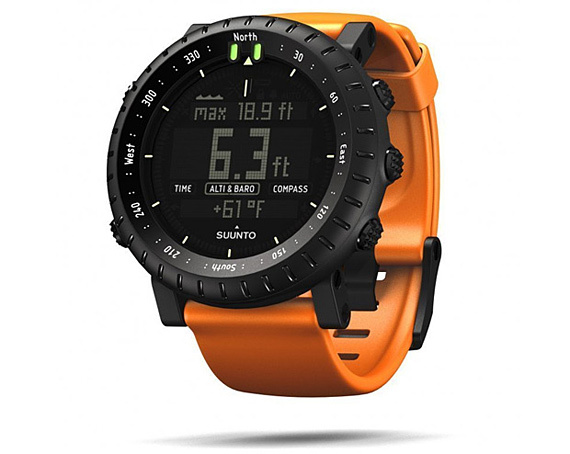 If you’re not as into orange Suunto sells this watch in a number of different guises, there are plenty to choose from. Aside from the aesthetics, this watch packs a lot of impressive features into a small package. Telling time is a given, but perhaps the coolest feature is the altimeter. It’s necessary to calibrate it correctly; this can be accomplished either by knowing your current elevation and setting it accordingly, or by a trickier method involving the calibration of the barometer function (which is also very swish.) the watch also has an alarm, calendar, stopwatch, light and button lock. It’s fairly large compared to an average wrist watch at 50mm and that is the concern that would make me want to try one on before I bought. It’s also waterproof to 30 metres, which is not diving depth, but certainly has you covered for showers, swimming, or even most snorkeling. For more extensive water activities (like SCUBA) you might look at some of their other products. This device is not cheap. The retail on the orange model is around £235. The least expensive Core model can currently be found on offer at Jura for £189. Categories: Suunto, Watch Blog, We Wants Muchly | Tags: digital, Suunto, watch, watches | Permalink. Spotted this Suunto out in the wild on a fellow MINI enthusiast on the YAM MINI stand at Himley today. This is a real watch with purpose and the rubbing and scratching on the bezel reinforced this impression. I have a lot of respect for this cool watch. Categories: Suunto, Watch Blog, Watch Spotting | Permalink.